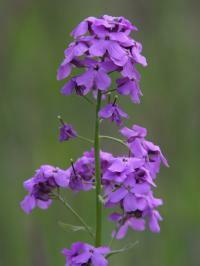 Rocket (Hesperis) - H. matronalis is a popular old garden plant, and among the most desirable of hardy flowers. 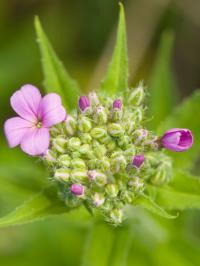 It bears showy, varied, and fragrant flower-spikes. The original single-flowered kind grows 1 to 3 feet high, and has pinkish flowers, but the double kinds are much more valued. 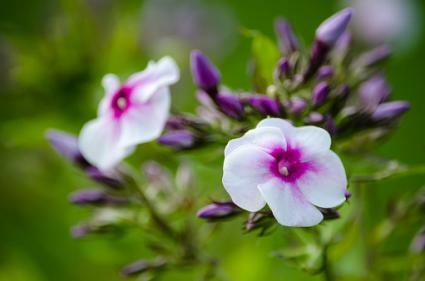 There are two distinct forms of the double white Rocket as well as of the double purple Rocket in cultivation. One is a tall white, turning to a pale flesh color with age; the other is the old white variety, of dwarfer growth, with smaller and more compact flowers. It is commonly found the north, but is little known in the south, where it does not flourish so well as the common variety. There is the old purple double Rocket and a free-growing dwarf form known as Compactness, which has also larger and darker flowers. Rockets require care in cultivating, and will soon be lost if left to themselves. They should be divided at least every second year and transplanted, for they seem to tire of the soil and to require more change than most perennials. If the young shoots are formed into cuttings when they are about 3 inches long, they strike very freely in the open ground, and the spikes of bloom on the remaining stems are all the finer when some of the others have been removed. When shaded from the sun for about three weeks with a few Laurel branches, the cuttings do better than when covered with a pot or box, as has been advised. 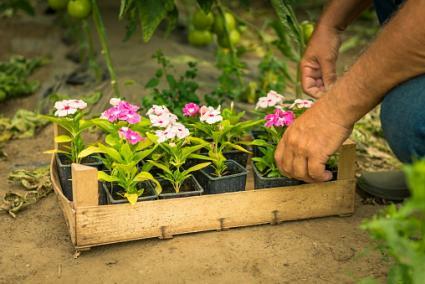 They like a rich, rather moist and strong soil, and are all the better for repeated applications of liquid manure if the soil is not as deep and good as it should be. Double Rockets really belong to the garden plants requiring annual attention, and cannot well be used as true perennials. It is always worthwhile having a bed of them in the reserve garden in case the plants should be lost or neglected in the borders. We have seen them best grown where there was a yearly transfer of plants from the reserve garden to the mixed border, and the groups look very well. 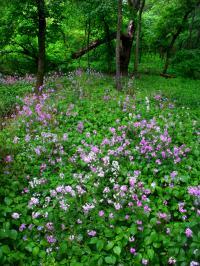 The single Rocket is easily naturalised, and is a showy plant in woods or shrubberies. Hesperis/Rocket makes a very nice addition to any garden, but especially an heirloom garden filled with other long-popular plants. Check your local garden center or garden catalogs to see if there are specimens that will thrive in your region.